Shire Horses are generally calm and placid so, when one came thundering towards me as I crossed a field on a public footpath with my bouncy dog, I stood rooted to the spot and crossed my fingers - well, there was no way I could out-run it! Centuries ago, the only British horses were small ponies, like the ones that roam the New Forest. Therefore, larger, stronger horses had to be imported to cope when knights began wearing heavy metal armour. As times changed, the horses were utilised for pulling heavy equipment - on farms, for deliveries and, going full circle from carrying knights in medieval wars, pulling heavy artillery in later wars. These gentle and intelligent animals played a major role in daily life prior to the invention and widespread utilisation of engines - towing canal barges, pulling passenger vehicles and beer drays. 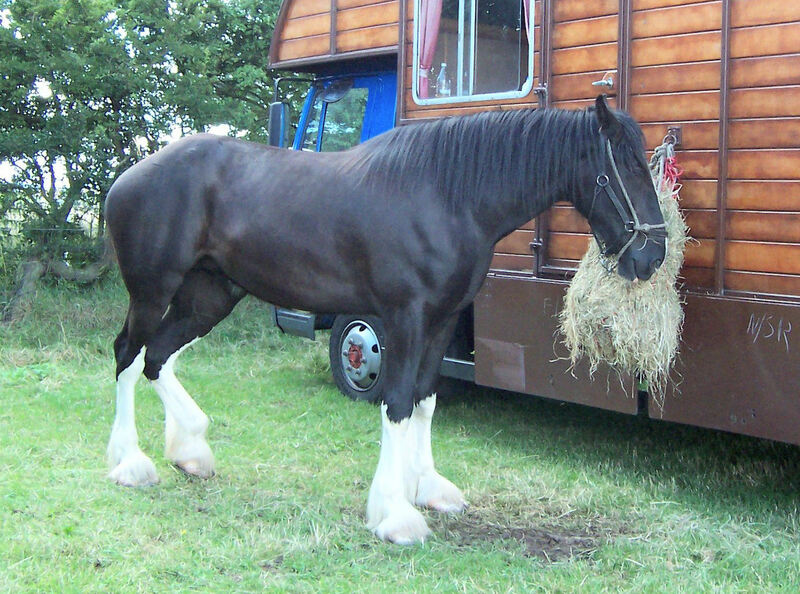 Shire horse numbers fell dramatically during the first half of the 20th Century but small numbers continued to be bred and the magnificent Shire horse has its place in today's world. Oh, and the horse in the field stopped inches from me, stood quietly for a moment then ambled off.